Welcome to the final installation of the squat progression in the BridgeAthletic Building Blocks series. I hope you have enjoyed this second progression and look forward to sharing more progressions in the coming weeks! The next progression in the Squat series is the Barbell Back Squat. This is by no means the final step in the squat progression. In fact there are many other versions of the squat such as the Front Squat and Overhead Squat, but the Barbell Back Squat is a cornerstone in any strength program. Check out our E-Book to unlock more of the squat progression. IMPORTANT! Please ensure that the athlete performing the Back Squat has had the appropriate progression leading into this. If you or your athletes' have taken some time off from training, I also recommend reviewing the progression, as anytime you load your spine and multiple joints, your body needs the appropriate physiological and timed progression. Take a look at the Barbell Back Squat below. With the added load of the bar on your back, focus on your balance, especially on the downward movement of the squat. Feet are slightly wider than hip width apart, toes slightly rotated out. Hands are placed a comfortable distance apart on either side of the bar. Work initially on a tempo of 2 to 3 seconds down, a slight pause and a controlled return to the start position. Do not lock your knees out at the top. Pause and repeat. 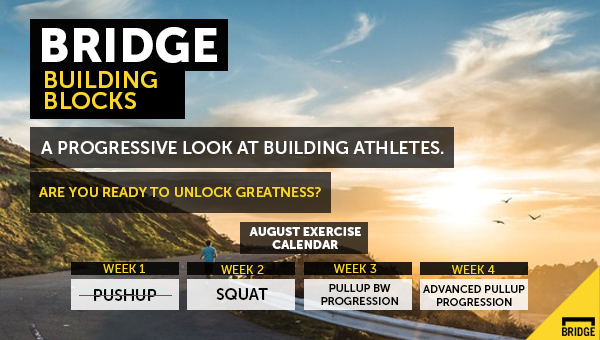 Be sure to check back next week for the BW Pullup Progression.